A new study wanted to see if emotional clarity is a factor in greater levels of empathy. This briefing will be useful to anyone involved in any way with emotional intelligence, human resources or learning. It will also prove very useful and interesting to anyone involved in leadership or management development. and a range of other engagements that have a significant influence on organisational outcomes. The number of recent reviews of organisational talent management and I-O psychology practices has found that the range of practices, instruments and methods used in organisations include a significant number that have absolutely no validity or research backing whatsoever. A new study by a team of researchers and practitioners across America has looked at this issue in depth to try to quantify the scale of the problem. They discovered a significant problem that they termed as anti-talent and anti-industrial-organisational psychology practices. This refers to the use of what the researchers’ term “the use of novel, trendy, simplistic or otherwise ‘pet’ frameworks and alleged ‘best practices’, regardless of their basis in science (and sometimes intentionally at odds with the research), to create a ‘buzz’ in an organisation for the industry, and/or achieve specific objectives…” Or to achieve ‘quick wins’, or score points with leadership or management, or simply to enhance their own status. Confusion about what lean actually is and how to implement it. Difficulty in implementing and adapting lean to non-standardised and non-manufacturing scenarios. Difficulty in implementing lean in low-volume, high variety situations. Difficulty in balancing and integrating organisational strategy and operational lean methodology. Not having a coherent theory and set of principles around the implementation and objectives for using lean. Trying to shoehorn lean into a new operational space, without considering the idiosyncrasies of the situation. Not considering the impact of implementing lean on the workforce. Not looking at lean as a long-term sustainable project. This research study was a longitudinal (over a period of eight years), qualitative study to examine the issues of implementing lean in non-traditional workspaces in the UK. The briefing will be interesting and useful to anyone interested in or involved in lean in anyway but particularly for people involved in lean implementation. Engagement with work as a general concept. It is not difficult to see why there has been such an interest in engagement as a concept. A new (2018) study looking to create an empirical classification of engagement at work has worked out scientifically what factors are actually involved in engagement. A useful briefing for anyone involved or interested in engagement. The vast majority of recruiting these days is done online; a recent survey (2015) found that 100% of large organisations in the West now use internet-based recruiting systems to find and attract applicants. Largely, these web-based systems focus on using social media channels, as well as other job and recruitment specific websites, portals and services, in order to find and attract the highest quality candidates. Previous studies have found that a range of factors increase the success of online based recruiting systems, such as ease-of-use, aesthetics, navigability, font or typeface, for example. Additionally, studies have found that how the characteristics of the job are portrayed online has a significant impact on the quality of candidate it attracts. Further, researchers found that the characteristics of the organisation and how they are communicated, for example the brand, stories in social media et cetera have a significant impact on the quality of the candidates attracted. One fruitful area of work is attempting to match the message that is put out by the organisation (about the organisation and the job) with the characteristics, values and attitudes of the type of candidate they wish to attract. This has been found to be a particularly useful approach in finding the right type of candidate for the job vacancies. Engineering which values are displayed online through the website and recruiting messages on e-recruiting platforms. Providing contact (or not) with existing employees within the organisation. The organisation itself, in terms of its own capabilities, resources and flexibility. The reactions of the customers or clients. The reactions of the market in general. Environmental issues, like the economy, political decisions, technological advances and a range of other issues. A new study has found that organisations tend to be good at quantifying known risks, but often fail completely to understand the range of uncertainties that surround their strategy. Any organisational or inter-organisational project is essentially about change. However, some projects are ostensibly about creating organisational change, as opposed to intra-organisational change. Whilst there are many, many research studies looking at project management, there are few that look at organisational change from a project management perspective, and fewer still that look at change from an inter-organisational project management perspective. A new study has investigated what practitioners actually do during change projects in inter-organisational settings. Inter-organisational projects are programmes of work carried out by ‘diversely skilled employees’ who work together, as a team, for a limited f time and who are from more than one organisation. In other words, inter-organisational projects involve a group of organisations cooperating and coordinating efforts to develop and deliver a complex service or product. Mergers and acquisitions (M&As) are ubiquitous. Companies and organisations use mergers and acquisitions to accelerate their growth, acquire valuable assets, capabilities and resources, achieve a competitive advantage or even reduce or eliminate competition. Despite this, all indications are that many merger and acquisition strategies fail to meet their intended objectives and outcomes. Many previous studies have identified that whilst there are a diverse number of factors which seem to contribute to the failure of M&A’s ability to meet their objectives, a significant portion of failures or poor performance are due to the intricate nature of post-merger integration or PMI. One of the post-merger integration factors that has been identified as presenting a significant challenge with M&As and the one which presents probably the largest risk is merging the people, their cultures, working practices, thinking and other issues, which are essentially all to do with the personnel and Human Resource Management (HRM). A new study wanted to see how the management practices (HRM practices) in the contributing or merging organisations influence and impact post-merger integration. Most of the identified issues with M&A success occur at the stage when the merging organisations are trying to integrate with each other. Innovation capacity, or the capability of an organisation to invent new processes, systems and products, is a key indicator of long-term organisational outcomes, sustainability, competitive advantage and organisational flexibility. A number of previous studies found that leadership is a key factor in the promotion and facilitation of innovation and employee innovation behaviours at an organisational level. A new study looked at the impact of leadership on organisational innovation capacity. Some people struggle with uncertainty and ambiguity more than others. The question as to what makes the difference between people who automatically have a negative response to uncertainty, and people who either have a neutral or positive response to such situations is an important one. Previous studies have found that, despite a range of reactions to ambiguity and uncertainty (from wholly negative through to positive), the initial cognitive and emotional response is always negative. Studies in 2016 found that reaction times to ambiguous situations are significantly longer when an individual has a positive response to it compared to people who have immediate negative response. This suggests there is some additional processing going on in the brain, it is assumed, in order to turn the initial response to the ambiguous situation into a positive one. Virtually all of the research looking at this issue has been behavioural and based on physical response times (for example, having to push a button to indicate whether the subject feels positive or negative about the situation or cue presented). A new study conducted fMRI and multivariate neuroimaging studies of this phenomenon to see what is going on at a neuronal and pathway level in the brain as subjects were presented with ambiguous visual cues. One of the most important organisational resources in any organisation is knowledge. Knowledge is the basis by which any organisation creates value and competitive advantage. This includes explicit knowledge of things and tacit knowledge or know-how. The centrality of knowledge in the development of organisations and their functioning has resulted in a massive amount of research around this area. Organisations generate their own knowledge and obtain knowledge from other organisations and academic research. Indeed, external knowledge has become so important for organisations that an entire industry has developed and is growing based on providing organisations with external knowledge – namely management consulting. 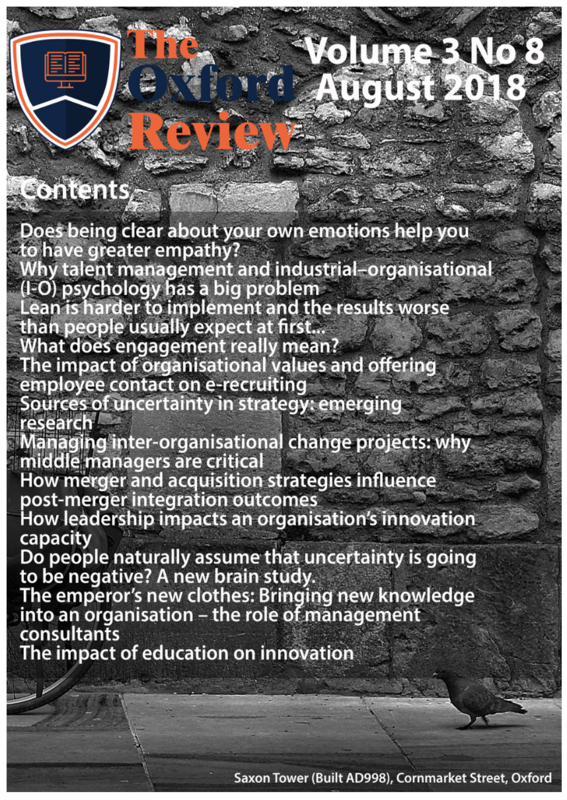 Whilst there has been an enormous amount of research effort looking at the role of knowledge within organisations, there has been relatively little looking at how external knowledge is actually transferred into an organisation, particularly through consultants. A new study has examined this issue and doesn’t make comfortable reading for anyone involved in Management Consulting, particularly in larger management consultancy firms. Does a formal education make any difference to an individual’s outcomes, beyond those of having a qualification? Whilst having a degree or other formal educational qualification has been shown to enhance the income generation potential of the individual compared to someone without formal educational qualifications, does education have an impact on an individual’s values? A new large-scale study across 96 countries and 139,991 individuals with a range of educational backgrounds from none at all through to people with PhDs has had a look at this issue. Previous studies have shown that, at a national level, education increases levels of innovation and economic growth. Participation rates in education has been shown to account for the economic differences between countries around the world. Formal education, even at primary and secondary school levels, has been shown to do more than just promote the acquisition of skills and knowledge. A number of studies have found that education tends to increase the level of autonomy and personal freedom an individual enjoys throughout life. A new study has looked at how education changes, both in the individual’s values and how this manifests itself nationally.